I was born in Pachuca, the Beautiful Windy City, with four premature teeth and my body completely covered in a very fine coat of fuzz. But I'm grateful for that inauspicious start because ugliness, as my other uncle, Eur pides L pez S nchez, was given to saying, is character forming. Highway is a late-in-life world traveler, yarn spinner, collector, and legendary auctioneer. His most precious possessions are the teeth of the "notorious infamous" like Plato, Petrarch, and Virginia Woolf. Written in collaboration with the workers at a Jumex juice factory, Teeth is an elegant, witty, exhilarating romp through the industrial suburbs of Mexico City and Luiselli's own literary influences. Valeria Luiselli was born in Mexico City in 1983 and grew up in South Africa. Her work has been translated into many languages and has appeared in publications including the New York Times, Granta, and McSweeney's. Her novel, The Story of My Teeth is the Winner of the LA Times Book Prize in Fiction. Valeria Luiselli: Valeria Luiselli was born Mexico City and 1983 and grew up in South Africa. A novelist (Faces in the Crowd) and essayist (Sidewalks), her work has been translated into many languages and has appeared in publications including the New York Times, the New Yorker, Granta, and McSweeney's. In 2014, Faces in the Crowd was the recipient of the Los Angeles Times Art Seidenbaum Award for First Fiction and the National Book Foundation's 5 Under 35 award. 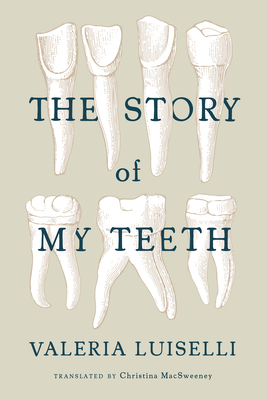 Her forthcoming novel, The Story of My Teeth, will be available from Coffee House Press in fall 2015.